We moved into a brand new house one year ago. Though three children and a dog have added their marks to doors, walls and counter tops, the house still feels new. The carpet shows exactly one spot of wear. It took me a while to realize the source of the worn circle next to the piano pedals, a circle that reappears no matter how often we vacuum the shag to attention. 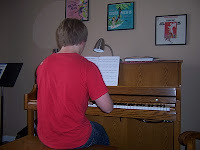 Then one day I watched Alec play piano, watched his heel push into the carpet as he worked the pedal. 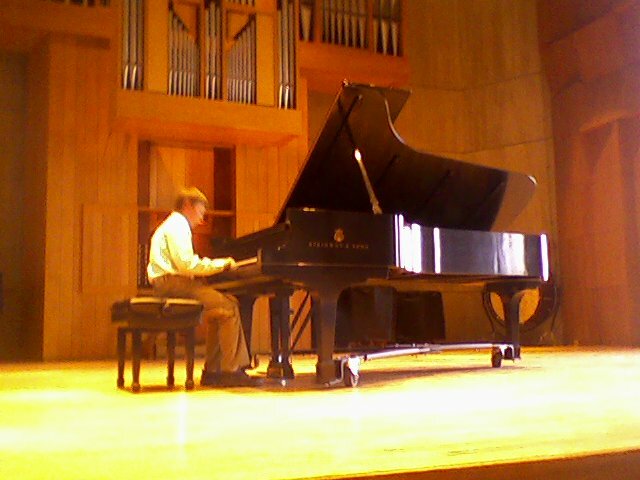 He ignores me when I stand and watch him play, absorbed as he is in his music. He leans into the keys, occasionally tapping the rhythm with his toe, and music fills the house. In true teenage boy fashion, my son rarely discusses his stresses or elaborates about his worries. Instead, he plays the piano. He takes after my mother in this respect, and I envy them both. Childhood summers found me sitting in my grandfather's house, reading in the living room while Mother and a revolving collection of relatives created music around the piano in the side room. I remember gauzy curtains on the windows surrounding the piano, the scent of geraniums from the entranceway, and the murmur of voices figuring out parts or planning a violin obbligato. Those same voices rang out at family reunions and brought the Spirit rushing in at Grandpa's funeral. Heavenly choirs have nothing on the Corry family, except perhaps a touch of hushed reverence. 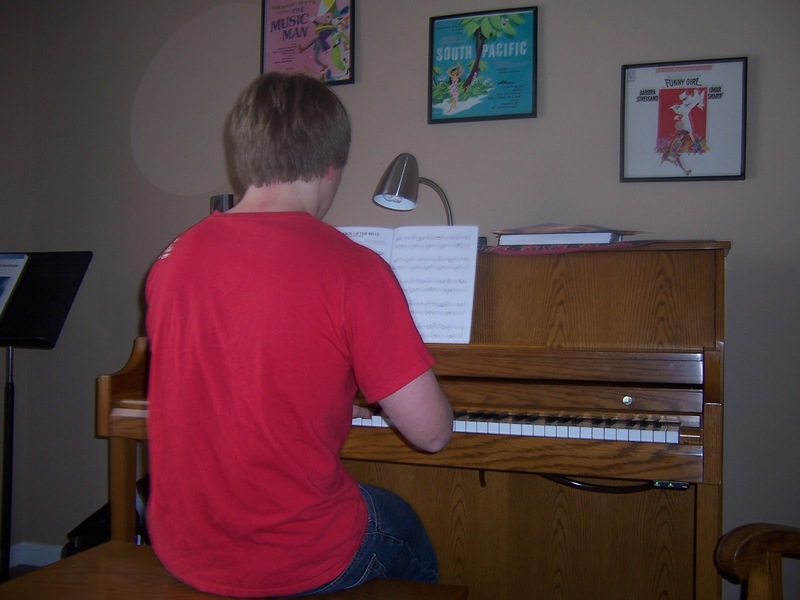 I used to dream of sitting at Grandpa's piano in an otherwise quiet house, running my fingers along the keys and sending my joy, my anguish or simply my moment of peace winging up Cedar Mountain by way of Chopin or Rachmaninoff. I never did learn how to filter my soul through my fingers. 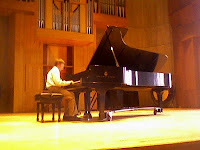 Periodically, I sit down to play a sonatina, sure that the emotion bubbling up inside of me will somehow guide the notes. Inevitably, I stumble on a chord, fracture an arpeggio, and eventually give up in disgust. For a time, I hoped my voice could carry me where my fingers could not. I studied, practiced, sang concerts and funerals, even taught some wonderful students. I remember two times in particular when I caught a glimmer of the feeling I sought. In preparation for a master class, I finally gave in and learned a German art song full of emotion simmering just barely in control beneath the surface. With the master teacher's whispered coaching in my ear throughout the song, I felt the music and my soul click together for just a few moments. The music swelled, and my voice floated right along with it. I closed the piece, exhilarated by the experience. Later, I sang in the sanctuary of a cathedral. Huge windows overlooked Lake Champlain, and the audience faded to insignificance in the expanse of wood, concrete and air. A friend had composed a gorgeous arrangement of a favorite spiritual for the occasion, and we joined with a talented oboist. Voice, piano, and oboe danced in and out of the haunting melody. Again, I felt the music and my soul combine. I have not felt my voice and spirit click in many months, and I doubt I will feel that connection in the same way again. I have come to accept the fact that music is not my calling, though my soul responds to the talent of others. At the same time, this need to write has my fingers traveling keys again. I feel the tug of my soul reaching. More often now, the spirit inside me finds expression, and I feel the exhilarating click. The quest continues. My father had a wonderful comment, which I hope he will forgive my posting without permission. At the end of the comment I've posted the lyrics to the song he references. "I wanted to comment on one particular passage: 'I have not felt my voice and spirit click in many months, and I doubt I will feel that connection in the same way again.' I am reminded of an old song, 'The Lost Chord.' Perhaps you know it. 'Seated one day at the organ, I was weary and ill at ease, and my fingers wandered idly over the noisy keys. I knew not what I was playing, nor what I was dreaming of, but I struck one chord of music sweet like the sound of a great amen.' Ever after the speaker in the song has searched for that one lost chord, never again to find it. I used to think, years ago, as I heard that song that there are only a finite number of chords that can be played. The lost one is among them, is findable. But of course I was wrong. It was the chord in whatever context of sounds--and feelings--and setting-- that was special. The exact circumstances of the sound's appeal cannot be replicated, hence the chord is lost, never to be heard in precisely the same way again. So with your moment in the cathedral or wherever." Here's the song--"The Lost Chord," from a poem by Adelaide Anne Procter and set to music by Arthur Sullivan while at the bedside of his dying brother.